Asus A8N-Premium motherboard The board is nForce4 based with passive clipset cooling using heatpipes. The board has x16 PCI express slot for graphics adapter (or x8 when using two graphics adapters in SLI mode). AMD Athlon X2 3800+ processor I really like the responsiveness of an SMP workstation, but since the good ol' BP6 days, dual processors were just not for desktop use. With the introduction of the Intel D and AMD X2 dual core processors it's again within reach. Innovision GeForce 7800GT video card I do play some 3d games so I chose a reference design 7800GT video card from Innovision. It's just incredible to see the 7800GT is faster that the high end x1800 card from ATI that costs the double. Kingston HyperX KHX3200AK2/1G memory CL2.5? I guess it's value-ram with a heat sink. Zalman CNPS9500 cooler Low noise heat pipe cooler in pure copper with 8cm fan. The hardware installation went smooth. I used the nice free utility nLite to prepare a bootable Windows XP x64 edition CD image with integrated nForce4 SATA drivers. After OS installation I installed the 64 bit drivers for my hardware. Note: The Unknown Device in Device Manager disappears when installing Asus AiBooster. I also installed CPU-Z for monitoring system frequencies, 7-Zip (x64) for CPU/RAM load and quick benchmark, and finally Half Life 2: Lost Coast (x64) for 3D benchmark and stability verification. For reference the stock system ran 72 fps in the Lost Coast video stress test. Then I prepared the BIOS for overclocking: Turned off Cool'n'Quiet, Q-Fan, locked the PCI bus at 33Mhz, and HyperTransport at 4x. The suggested RAM timing is CL2,5-3-3-7-1T at 400MHz but I locked it at CL2 333MHz. Though the CPU runs stock at 10x200MHz I lowered the multiplier to 8x before overclocking the front side bus. In Windows I started the 7-Zip benchmark to load the CPU, then used Asus AiBooster to raise the external frequency in steps of 5MHz until the computer froze at 245 MHz. 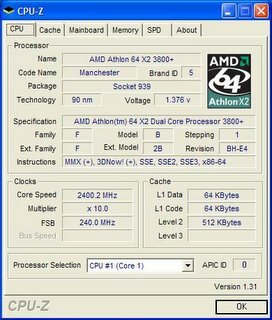 In BIOS I lowered the frequency to 240MHz and booted Windows. I started the 7-Zip benchmark to verify stability. In AiBooster I raised the CPU voltage from to 1,35 to 1,375 and the set the multiplier back to x10. I was glad to see the system was still stable, running at the speed of the 4600+ X2 that costs the double of my 3800+ X2! Ran the Lost Cost video stress test again, now I got 98 fps.